We offer a grab muck away service in Hertfordshire, Bedfordshire, Cambridgeshire, Essex and North London. 8 wheeler, 6 wheeler and 4 wheeler grab lorries (part loads also taken) or load one of our tippers without a grab. 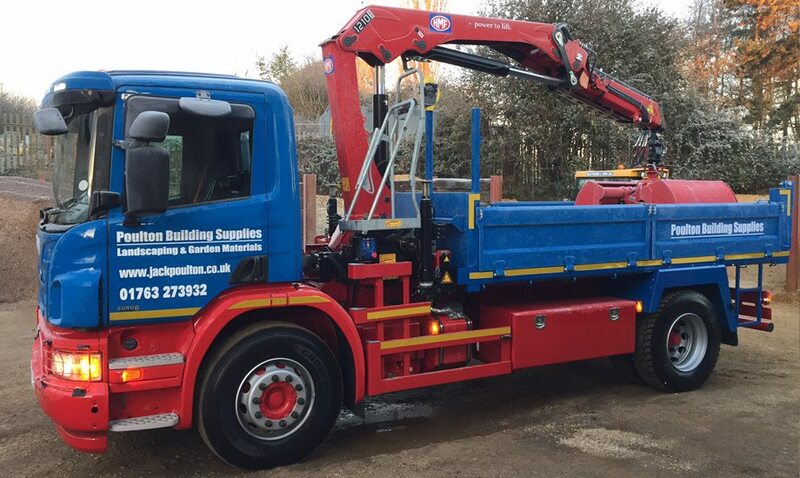 Jack Poulton & Sons can supply grab hire in Hertfordshire, Bedfordshire, Cambridgeshire, Essex and North London with lorries for any size contract or small one off job. We run a fleet of 8 wheeler, 6 wheeler and 4 wheeler Scania grab lorries with Epsilon cranes. Our grab hire vehicles have the capability to grab materials up to a distance of 7.5 meters from the side of the vehicle. Our vehicles can not only remove muck away but also deliver aggregates loose or deliver jumbo/bulk bags. Loose loads can just be tipped off or grabbed off on the site. We also offer a muck away service on 8 wheeler tipper lorries (which need to be loaded on site by a digger). Please call 01763 273932 for some very competitive prices. We now offer a muck away service on 4 wheeler 7.5 tonne tipper lorries which can carry 4 tonne of muck at a time (which need to be loaded on site by a digger). Phone 01763 273932 for a competitive price and a professional, fast, effecient and friendly service. Need to hire a digger or dumper?